Ultimate guide bricking a Karotz. I think this was the main source for rooting a Karotz, other sites often point to this one. Great (French but with translator) source for all the info you need to root your Karotz. Including a lot of technical info, sources, rooted firmware and other stuff. German site with useful information (also theory), good explanation and steps to create a bootable USB key for root telnet access and more. 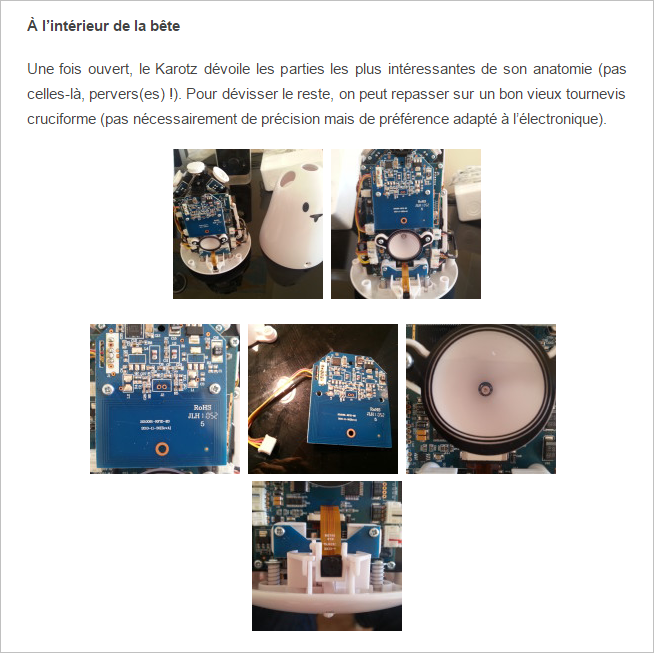 Another French webpage about rooting a Karotz. With links to Wizz.cc firmware files. More tech info about rooting a Karotz. The main source (in French) for Open Karotz. Create an account and get lots of apps for your Karotz running Open Karotz. Bootstrap based interface for a Karotz running Open Karotz. Look what is inside of your rabbit. Complete dissection of a Karotz. Click on the pictures to see all the details. Another look inside your rabbit. Guy that took his Nabaztag (Karotz ancestor) apart and wants to replace the controller with a Raspberry Pi (not finished yet). Hack the Nabaztag. Instructables. Girl who replaced the controller in her Nabaztag with a Teensy, including making the ears working again. Create a serial console to get low level access to your Karotz. Add an audio output jack to your Karotz (in French). LinkedIn profile of Yoann Sculo, one of the Mindscape developers that worked on the Linux software of Karotz. Announcement of the end of Karotz on a website where you can find more Internet-Of-Things no longer with us. Information about BusyBox, the heart of your Karotz (Linux) commands. BusyBox is the Swiss Army Knife of Embedded Linux. French information about Karotz compatible USB Ethernet modules. More info about a Karotz compatible Ethernet module. Forumpost started by the creator of Open Karotz. Another forum where there is still some recent activity about Karotz. Information on Wikipedia about Nabaztag and Karotz (version 3 of Nabaztag). Nicolas SAN AGUSTIN: Dissection of the rabbit.